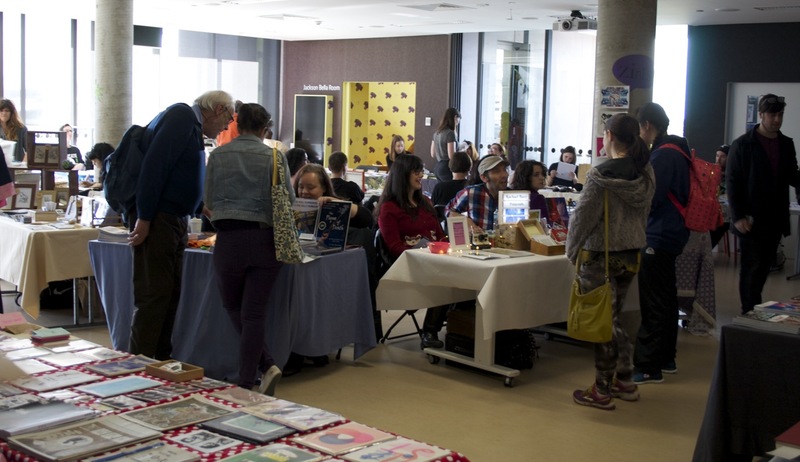 Last year, I went to two zine fairs in one day. 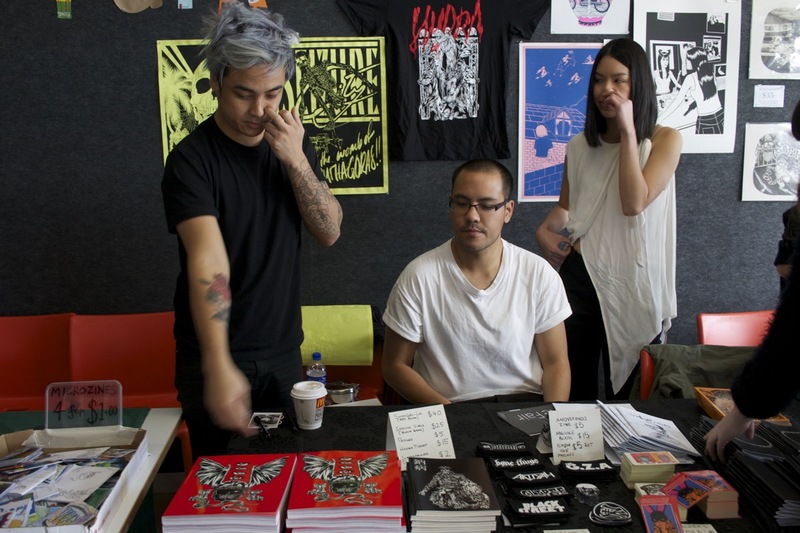 The Other Worlds Zine Fair was organised in protest against one of the sponsors (being Transfield [Services/Holdings] who also manage the Nauru and Manus Island detention centres) backing the MCA, and thus the zine fair. 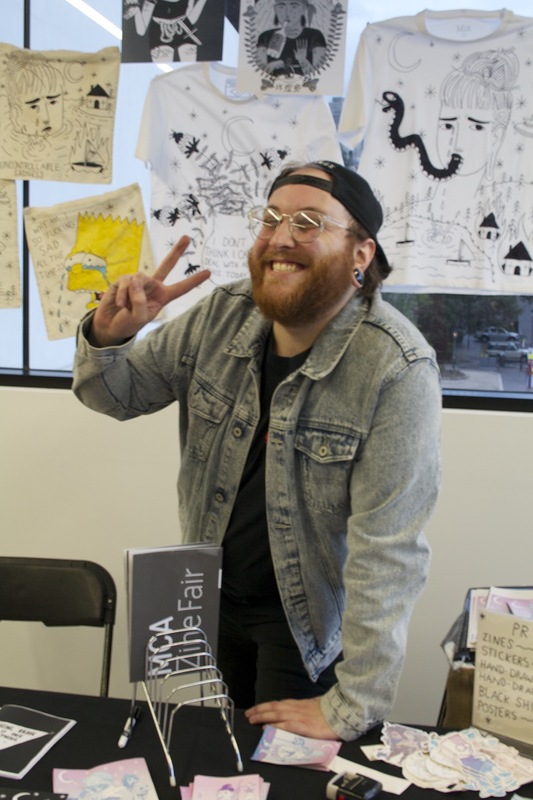 I had to see both, because it is pointless to see the protest zine fair and not see the impact on the other zine fair. 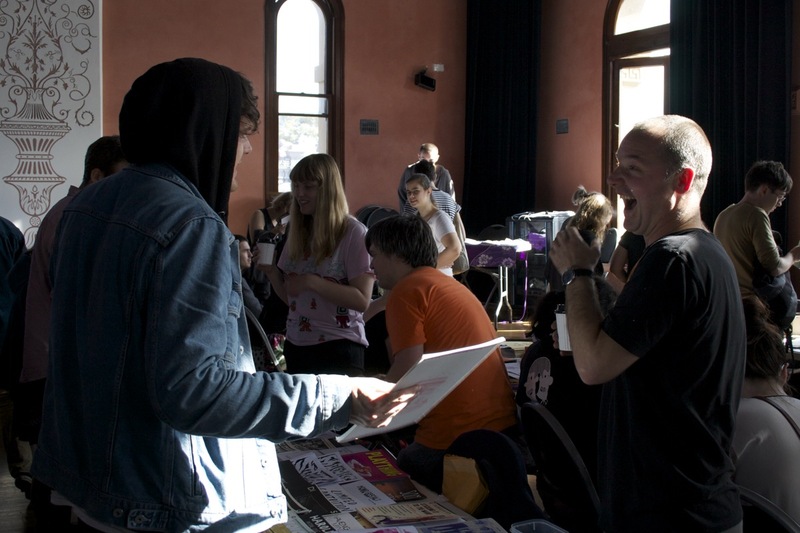 If I recall correctly, the MCA Zine Fair then was a bit subdued. Also looking at the official partners of the MCA, I cannot see a mention of Transfield. 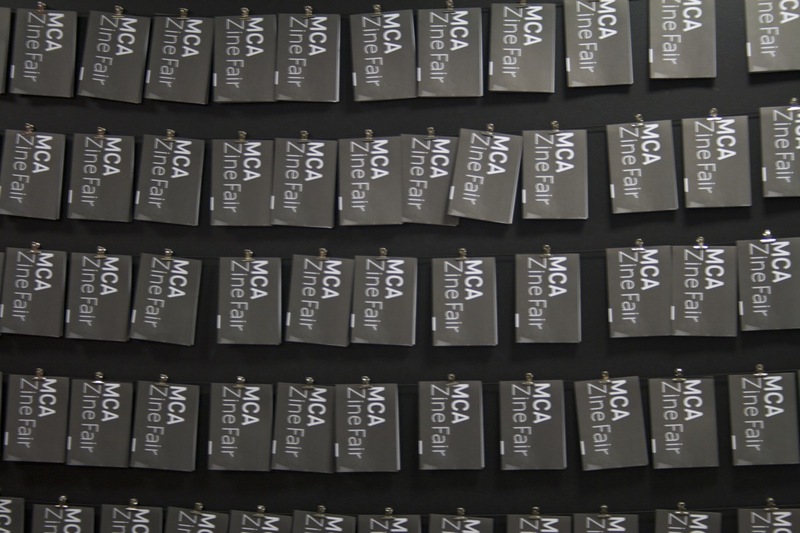 So while it appears the original purpose of the Other Worlds Zine Fair worked, it is back again to compete with the MCA’s. 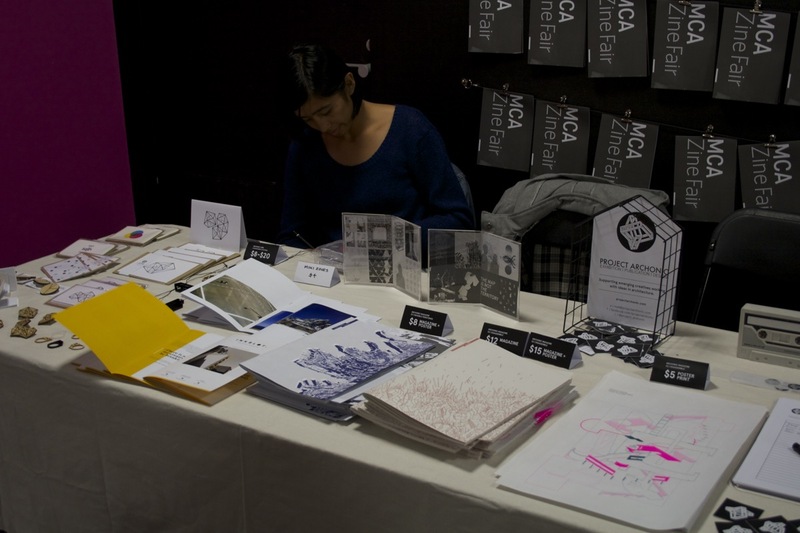 This year, MCA decided to run a zine fair over three days. According to the Other World’s FaceBook so were they, until recently, have now made it only one day†. 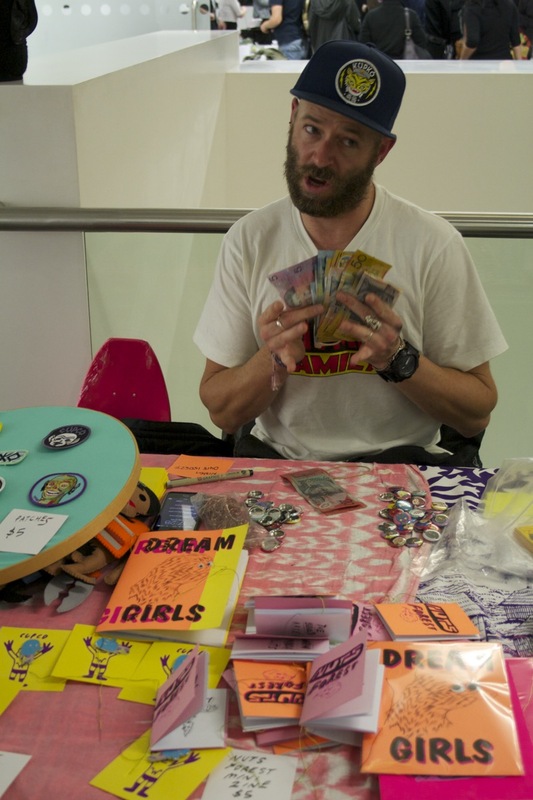 It’s opening night of the MCA Zine Fair. Outside, the clouds choose between not raining and raining just enough to warrant running under cover. 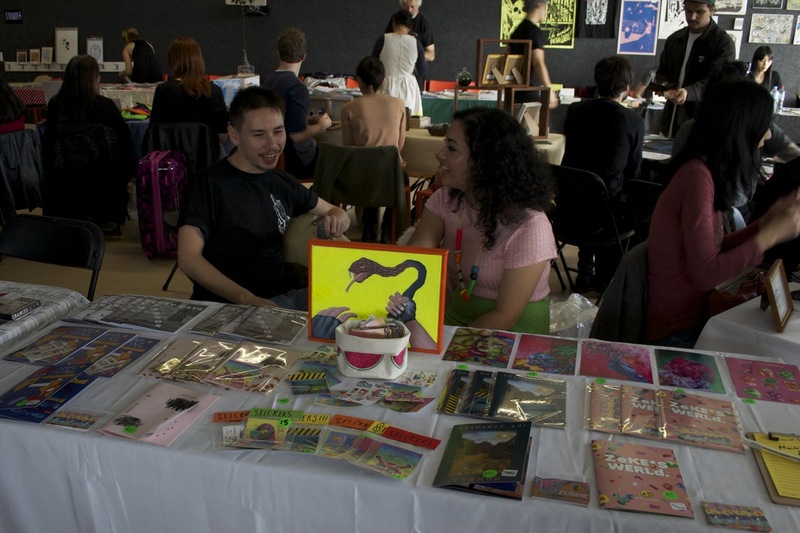 Previously, the zine fair was held in the function centre of the MCA, tables arranged around marbled columns. 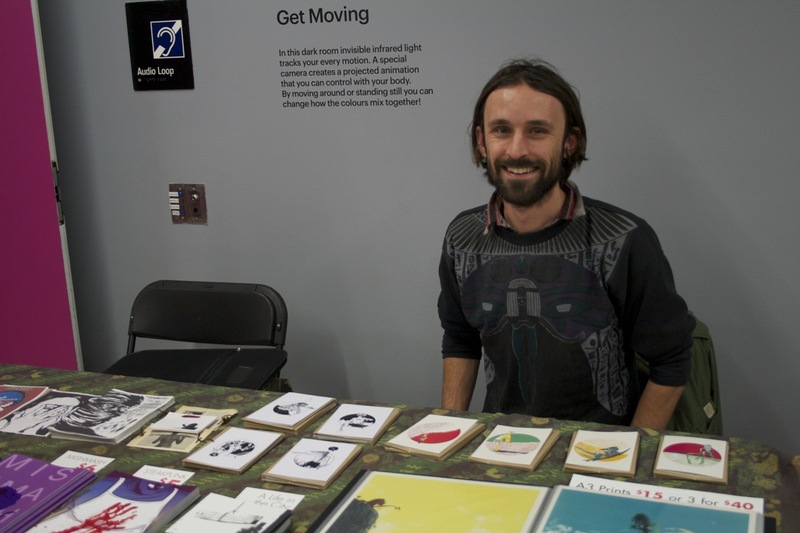 This year, the organisers in their wisdom have split it amongst two floors, forcing visitors to go deeper in the inner sanctum of the gallery. I’m not certain their reason for this, maybe the function centre was already taken, maybe they wanted to get crowds checking out the galleries on the way through. When I go through, people are still setting up. There’s a little bit of confusion and some of the tables are still empty. 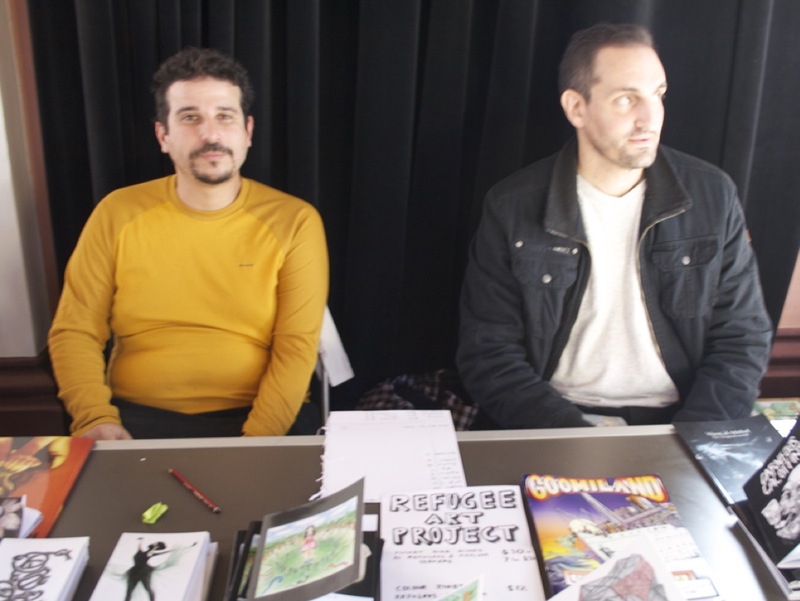 There’s a couple of familiar faces, such as Phillip Dearest and Louie Joyce. There’s a few interesting things I pick up along the way. An architectural journal. Some iron-on patches. A comic about cannibalism (naturally). I’m waiting on the big one tomorrow. I make my way down to the MCA and find that there’s been a change. 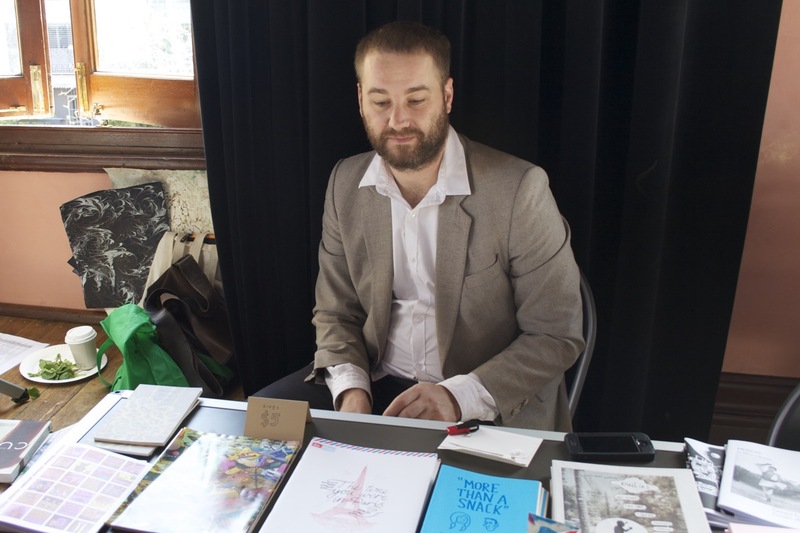 The tables that were allotted to zinesters on the previous night have now gone to others. Meaning the people that booked for more than one day during the fair now have to find their tables again. In fact, this wasn’t a last minute thing, it was in the brochure. But it did seem like an overhead in terms of organisation. I went during the morning so maybe the crowd hadn’t really sunk in yet. But it didn’t seem that busy. 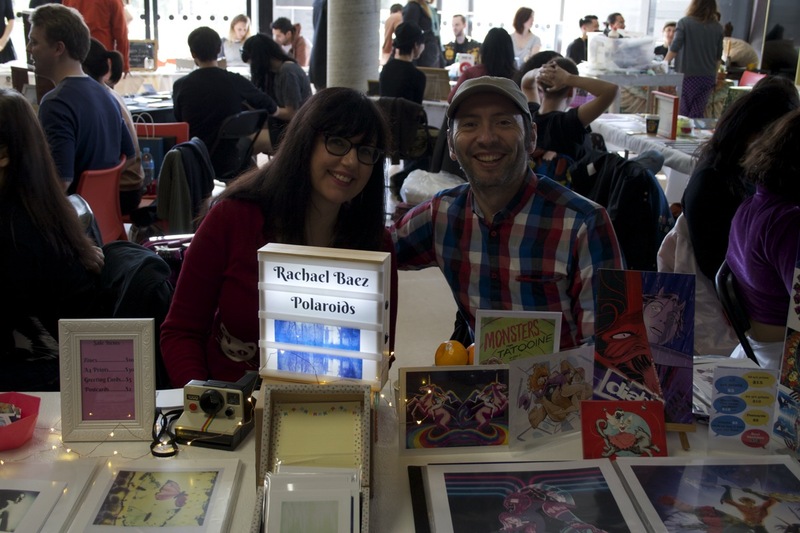 I managed to catch up with others I had seen at the fair in the last couple of years, include Rachael and Marcelo Baez, Jame Jirat Patradoon. And I got to meet Letter Artist Georgia Hill. 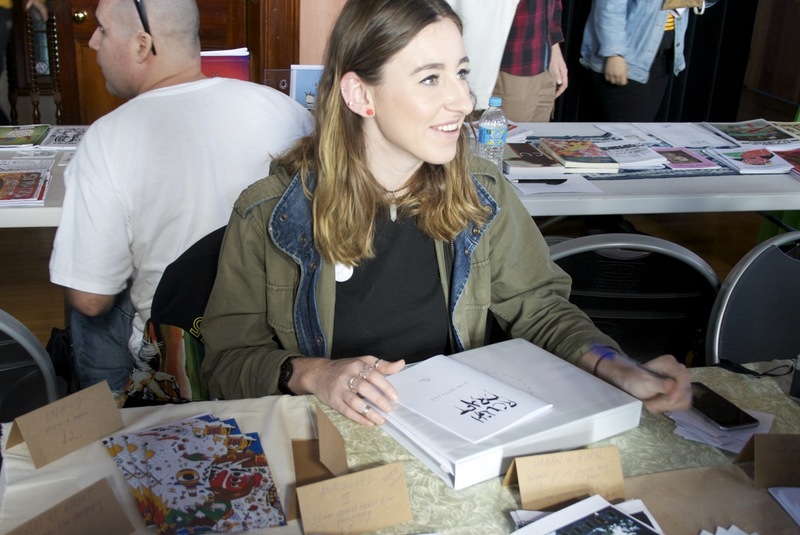 Most if not all of the zines were produced by illustrators, artists, comickers and the like. 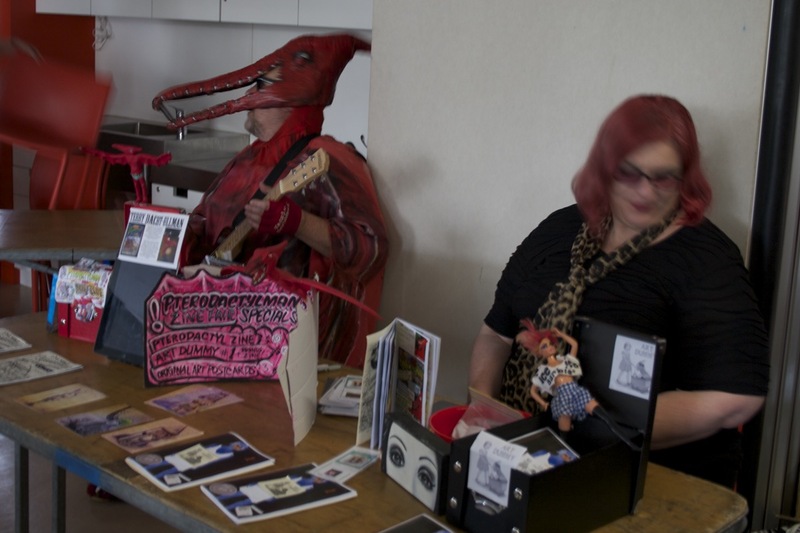 Unlike the other zine fair, the Other Worlds had that kind of familiar fair vibe. Likewise, there is a broader range at the Other Worlds. 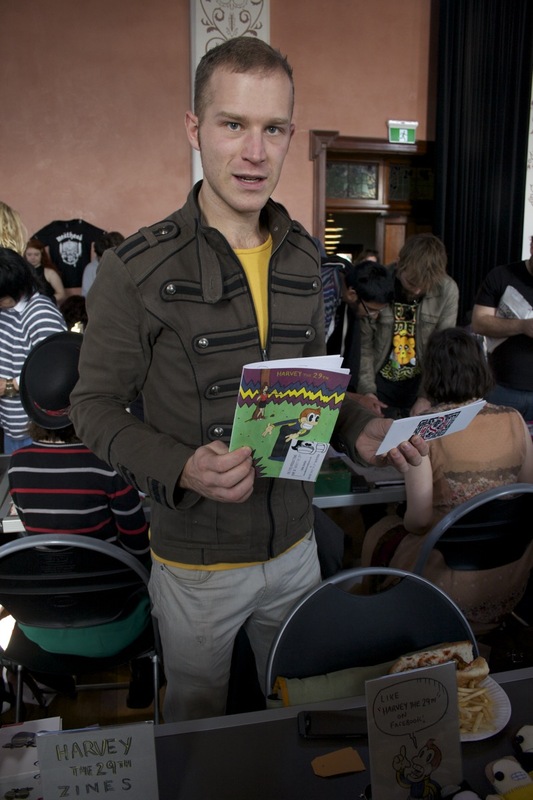 Naturally, being the zine fair in protest there are going to be zines of a punk/socialist/anarchist/LGBT flavour. 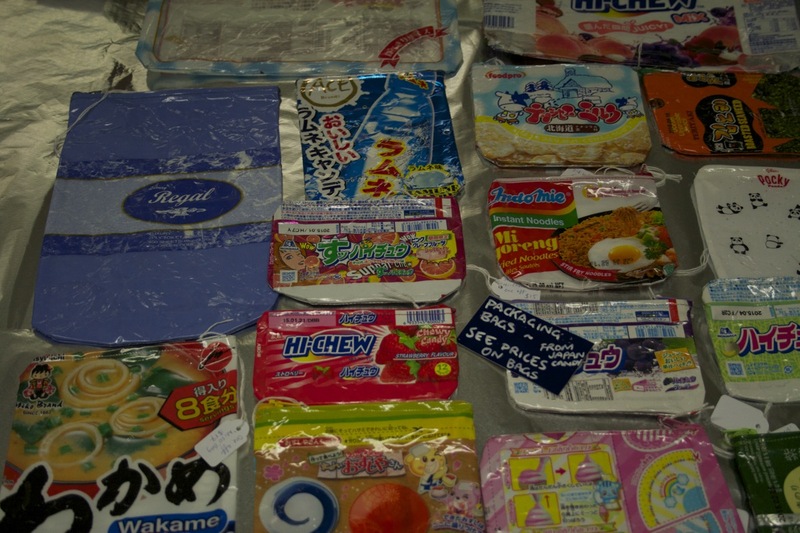 And there was plenty of that alongside journals, art books, photo collections and comic zines. And so briefly, I managed to catch up with the folks of the Sticky Institute, Vanessa Berry, Chris Mikul and Zoë and Raphael who are running the Poetry Slamboree next week. 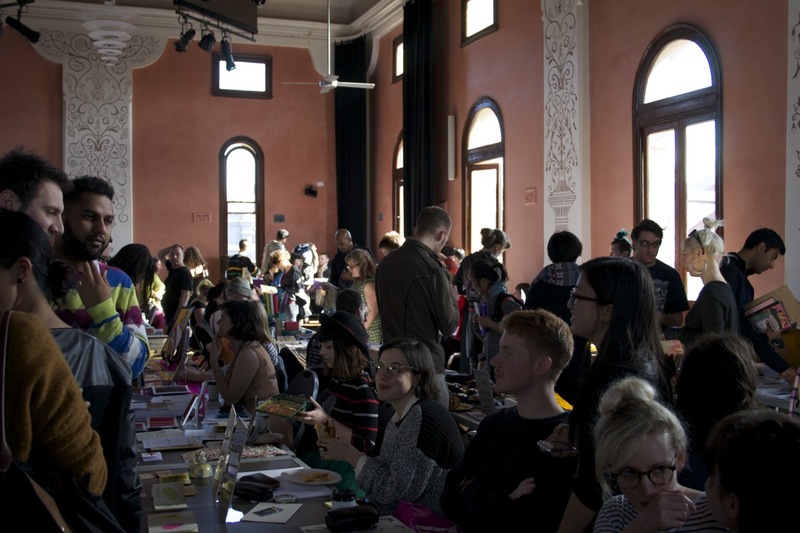 I will say the Other Worlds Zine Fair a one minor drawback and that was the space of the conference room seemed big enough for the tables and the zinesters, the thoroughfare for visitors wasn’t that wide. Meaning that if someone was having a chat at a table, the laneway could become easily blocked, grinding everything to a halt. 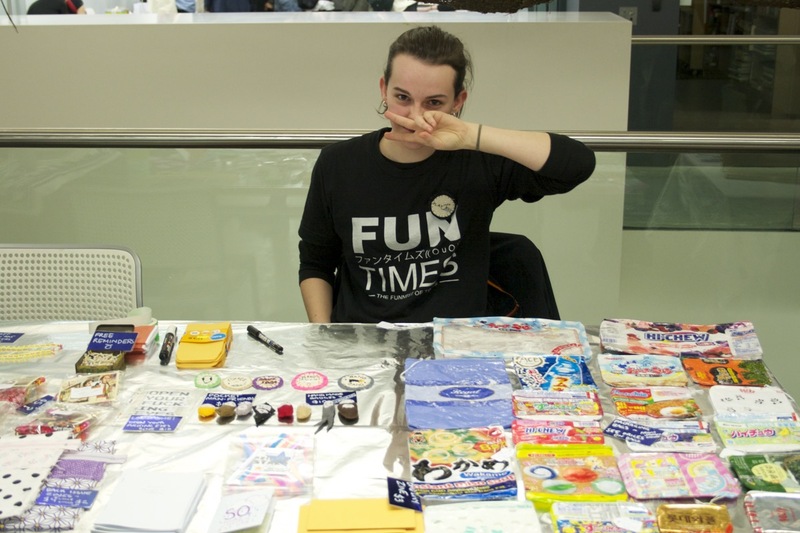 I enjoyed the Other Worlds Zine Fair more. 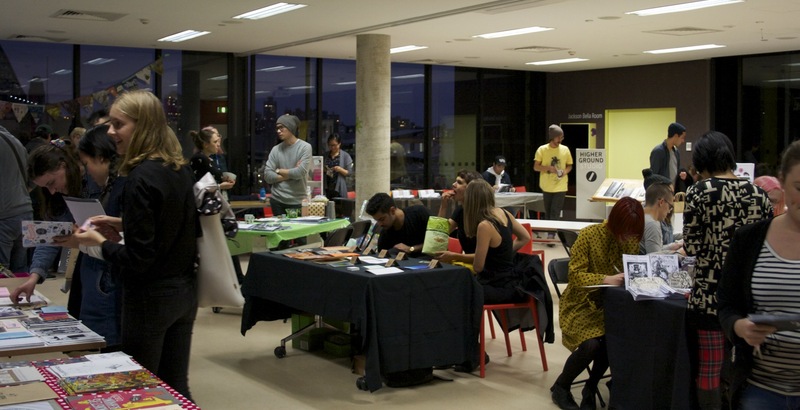 Splitting the tables to different levels in the MCA was a strange choice, and probably hints towards that they weren’t getting the numbers of participants they had in the past. I am curious to see where all of this goes next time and has me already thinking about next year. †Having only a FaceBook page infuriates me, because I am not part of the horde that joined FB. I really wish that someone would pony up for a domain name and a wordpress/tumblr/squarespace account. Addendum: I did go back to the MCA on Sunday and found the anarchist zine table from the Other Worlds Zine Fair, got to put a face to graffiti artist Mike Watt and sit in on a Georgia Hill workshop. So that was a bit of fun before racing back to catch a coach. 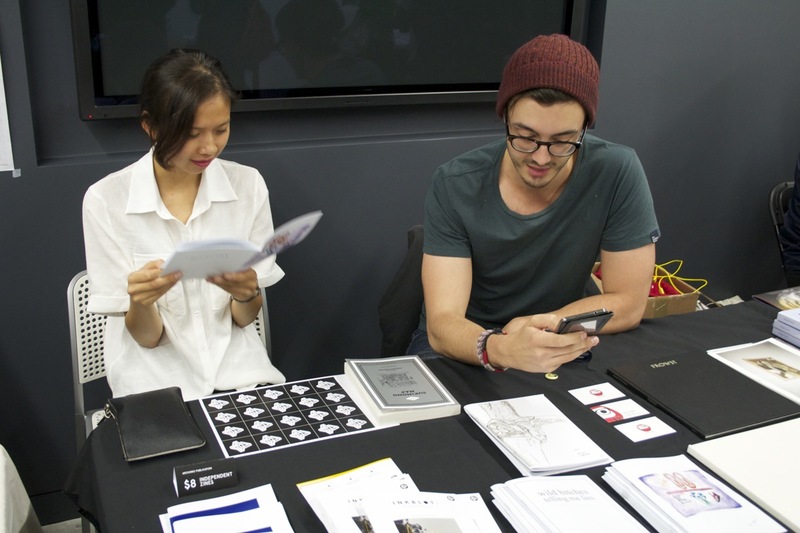 This entry was posted in zine and tagged fair, mca zine fair, other worlds zine fair, photography, travel, zine, zine fair. Bookmark the permalink.